401K Refunds: Not as Good as They Sound. Many hear the word refund and begin running down their imagery wish list of ways to spend this extra money. 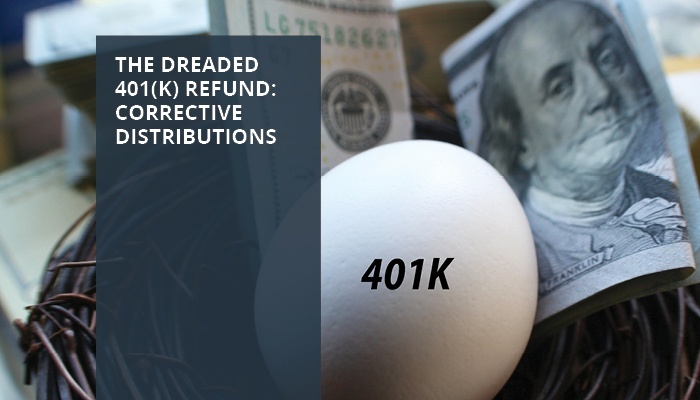 However, when it comes to 401(k) refunds, or corrective distributions, the excitement should be dialed back. Corrective distributions are a headache for plan sponsors and employees alike. Essentially, these refunds mean that your plan has failed testing, and tax deferred money that key employees set aside for retirement has to be returned to them. This is an issue for both you and your employees, in this article we are going to discuss what to do if you fail 401(k) testing and options. Your workforce is made up of two distinct employee demographics: highly compensated employees (HCEs) and non-highly compensated employees (NHCEs), also known as “rank-in-file”. An HCE is one who owns 5% or more of the company, a direct family member of an owner, or earns more than $120,000 per year and NHCEs make up the remaining portion of your workforce. These two groups share a common goal of reaching retirement, and although HCEs may be able and willing to contribute more, your plan should be designed with both parties in mind. The IRS requires that both highly compensated plan participants and rank-and-file plan participants contribute to their 401(k) plans at similar rates. If the idea of calculating and comparing percentages send you down a path of traumatic flashbacks of math class, don’t worry. Our goal is to simplify and educate not overwhelm, if you have more questions, we are happy to have that conversation. ACP stands for actual contribution percentage test; it is similar to the ADP test, only it tests employer matching contributions. So, ACP only applies to companies that offer a company match. It compares the average of the percentage of matching contributions and after-tax employee contributions for HCEs versus NHCEs. Top-Heavy test looks at how much HCEs contribute to the plan compared to everyone else. If Key Employee balances exceed 60% of the entire plan balance at the end of the plan year, the employer is required to make a 3% contribution to the non-key employees to be non-discriminatory. 401(k) test failures are no fun for anyone, it requires swift action for employers and plan sponsors. To correct plan failures, additional contributions may be required or corrective distributions would need to be made which means pre-tax savings returned requiring owners and key employees to refile their taxes… talk about a nightmare! Basic matching – The company matches 100% of all employee 401(k) contributions, up to 3% of their compensation, plus a 50% match of the next 2% of their compensation. Enhanced matching – The company matches at least 100% of all employee 401(k) contributions, up to 4% of their compensation (not to exceed 6% of compensation). A non-elective contribution of not less than 3% of compensation is made by the employer to all eligible employees, regardless of whether they defer under the 401(k) arrangement. The 3% contribution must be set by the plan document and may provide that this contribution be made to only Non-Highly Compensated Employees. Unless the participant elects otherwise, the deferral rate starts at no less than 3% and increases at least 1% annually to no less than 6% (with a maximum of 10%). 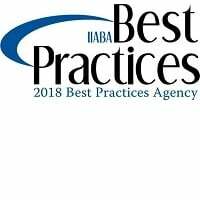 While a Safe Harbor plan allows owners and highly compensated employees to maximize deferrals, they do require specified employer contributions, and all contributions are immediately vested. Another factor to consider is distribution of employee communication, plan sponsors are responsible for notifying participants of their plan rights and obligations within 90 days of their plan eligibility date and 30-90 days before the start of each new plan year thereafter. Securities offered through LPL Financial, Member FINRA/SIPC. Investment Advisory services offered through Connor & Gallagher OneSource, a registered investment advisor. Connor & Gallagher Benefit Services and Connor & Gallagher OneSource are separate entities from LPL Financial. 2018© 401k Marketing, LLC. All rights reserved. Proprietary and confidential. Do not copy or distribute outside original intent.